Home > Services > Articles & White Papers > The current wave of retail failures tests the strength of established brands. The current wave of retail failures tests the strength of established brands. It looks like Toys R Us won’t be much longer. Already in Chapter 11 and unable to find a lender to help them restructure even a portion of their significant debt, speculation is increasing that they may soon liquidate their U.S. operations. 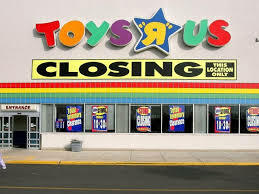 Once a hugely successful brand, Toys R Us joins a growing list of retailers that are struggling to stay in existence, including Radio Shack (all but gone), Claire’s Stores, The Sports Authority (gone), and Payless Shoe Source. Of course, the circle of life for retail brands turns as fast as any. Once high fliers like Circuit City and Borders bookstores are fading memories. Target and Walmart are pummeling K-Mart and Sears in the bricks and mortar retail category, not to mention what Amazon has done to revolutionize retail altogether. At the bottom of the Great Recession in 2009, the leading brand of paper towels, Bounty, actually grew its market share by 1.5 percent to a dominant 44 percent of the market. Despite competition from private label brands, “The quicker picker-upper” advertised aggressively, emphasizing its overall value and its Bounty Basics sub-brand. Bounty came out of the downturn stronger than ever. In 2008, Starbucks got better by getting smaller. Realizing that they had created an oversupply of stores (in a few cases, literally across the street from each other), they closed hundreds of locations and laid off more than 12,000 people. Tough times require touch decisions, but Starbucks has since shown steady growth and is now the number two restaurant in overall sales, ahead of Subway, though still way behind McDonalds. Speaking of the Golden Arches, McDonald’s has consistently weathered downturns better than most or all of their competition. During 2008-10, when Burger King saw its stock drop by more than 25 percent, McDonalds increased same-store sales and saw only a 3 percent drop in their stock price. Mickie D’s has schooled Burger King for decades on how to best run a burger joint, but with two keys to their success this time. First was aggressive marketing of their Dollar Menu (which has since been copied by virtually all fast food brands) and second was the introduction of a wide range of drinks including coffee and frappes that helped keep their check averages higher and new customers circling their drive thrus. Unfortunately for brands like Toys R Us, a significant drag on their ability to survive a rough patch is the huge amount of debt they have acquired over the last 10 years. Leveraged buyouts have their advantages, but when a brand is burdened by debt service, it drains away money that might have been invested in improving the brand. Toys R us has lacked innovation during a time that retail has become highly innovative both online and in store. Failing to prepare for the worst is likely going to cost their brand its existence.